An Insolvency Practitioner based in the UK began to focus on reducing the overall costs of managing personal IVA’s. After a period of acquisition, which included purchasing not only the IVA portfolio, but also, the different systems which serviced the IVA’s, this provider was struggling with managing the manual tasks of financial reconciliation as well as the weight of PDF attachments. The need to change was driven by the change in creditor’s views of how category 1 costs should be applied to the individual IVA’s. The Robot Exchange undertook a small 2-day process audit to identify the most valuable process to automate. The process that was prioritised was the one that was very manual, considered non-value add but critical in nature. 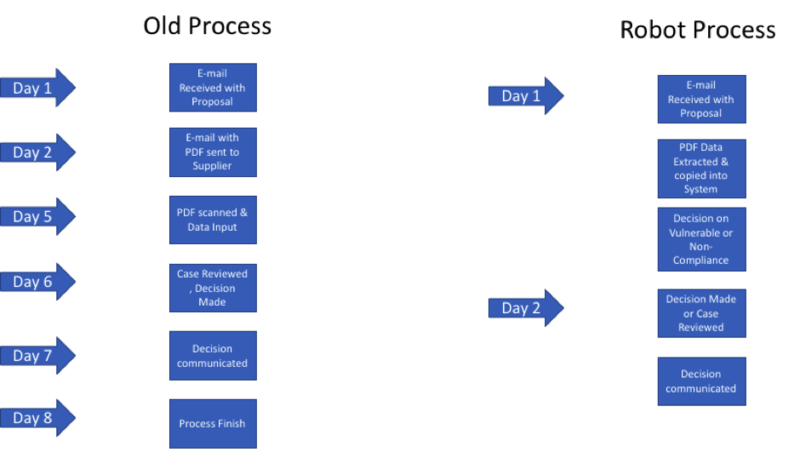 The Robot Exchange produced a document which captured the process for sign off with the client, then, within 2 weeks, produced a free proof of concept. The process was around the Insolvency Practitioners proposal document. Have an idea or process we can help you with? We can work with you to streamline your automated processes with both pre-written and custom Robots.